Later part of 2017 saw a rollout of Android O to various devices and rising demand for the same. While the official versions are still coming steadily, custom ROMs are subbing for it quite well. In that context, now Android Oreo for Huawei Honor 9 is being deployed and available for download, all thanks to developer OldDroid. This ROM is based on EMUI 8 and comes with latest Huawei UX, and Oreo goodies. 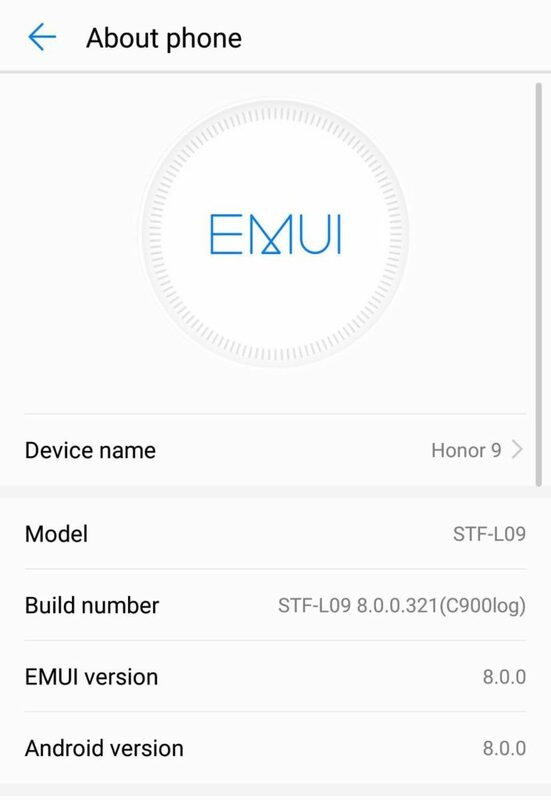 This update will move the firmware build number to STF-LO9 8.0.0.321(C900log) for the global variants of Honor 9. Like most of the custom build ROMs, this might not have all the features working perfectly. There might be some glitch but we can expect a fixed build from the developer side. We have included the active download link and also put up the details on how to install Oreo on Huawei Honor 9. This has been tested working on the Huawei Honor 9 STF-L09C432 variant. We has v already seen Huawei rolling out Oreo Beta program and and available for Mate 9 (Pro). It is also officially available for Huawei V9. How to install Android 8.0 Oreo onto Huawei Honor 9? Note 1: The downloads are listed at the end. So make sure to download them first before proceeding. Note 2: Download all the files and transfer them to PC and also make a copy to Android phone’s internal storage. This includes the SuperSU. Step 1: Make sure to OEM Unlock the phone, enable USB debugging, and Advanced Reboot from Developer Options. Step 1.1: Ensure that the Bootloader is unlocked on your Huawei Honor 9 on the Nougat firmware. Step 2: First, flash the TWRP for Nougat via Fastboot. Read: How to flash TWRP on Android phones? Step 3: Reboot into TWRP recovery mode and connect the phone to the PC. Choose ADB option in TWRP. Note: The code can also be found in the comments for those who want to copy the code. Step 6: Now we need to fix system issues like boot animation, ringtones etc. For that, you will need to install TWRP for Oreo and flash a package to fix it. Step 9: Install any root file explorer or file manager and open it. Step 11: In /version/special_cust/STF-L09/hw rename “normal” folder to “eu”. Step 12: Reboot the device. Now you are ready for Android Oreo for your Honor 9. So, install and enjoy your new OS. Below is the direct download link to get all the required files to flash Android Oreo for Huawei Honor 9. But before getting ahead with the installation note that AndroidSage will not be responsible for any damage to your device during installation. Next Entry How to Enable Face Unlock feature on any Android device?